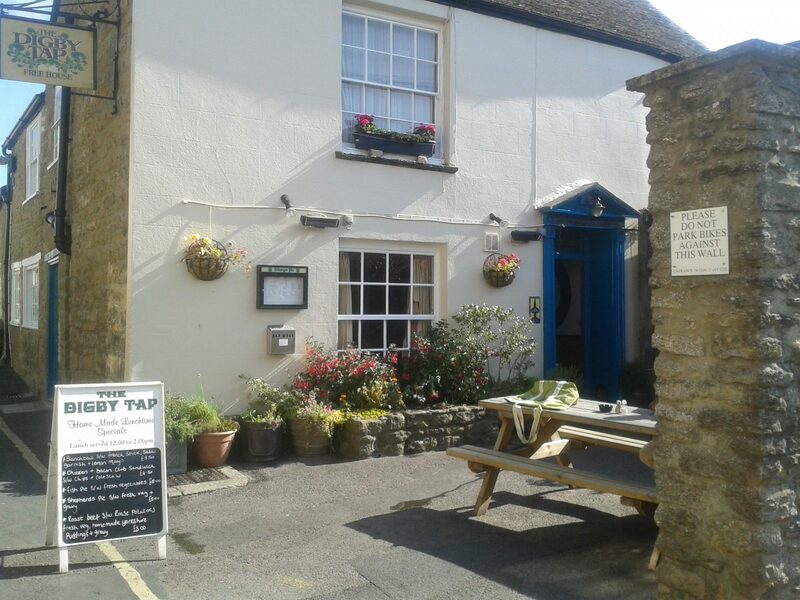 Set in the beautiful Abbey town of Sherborne, Dorset, The Digby Tap is a traditional freehouse selling a wide range of local and national ales. Home cooked food is available lunchtimes Monday to Saturday. Featured in various CAMRA (Campaign for Real Ale) publications including the Good Beer Guide and Good Pub Guide. The ales we have at the Tap are from local breweries and also those further afield. We run with four pumps on at all times with one being a ‘session ale’ and the other three ‘guest ales’. Cerne Abbas Ale – 3.8%. Tawny Ale, well balanced and triple hopped. This beer has a supple middle with a fuller mouth feel due to extra time conditioning, leaving you with a refreshing finish. Otter Bitter – 3.6%. Fruit notes and well balanced malty flavours are tinged with a hint of bitterness to make Otter Bitter a Devon beer of distinction. Teignworthy Neap Tide – 3.8%. A tasty and fruity bitter. Not much is known about the history of the building. The oldest part, furthest from the lane, is believed to date from 150 to c.1700. There is a large fireplace and mullioned window in the back bar. There are later additions and the end wall by the lane is believed to have been built when the lane was constructed. Stone bollards on the roadside would have been put there to keep the hubs of carts away from the walls and obviate the damage that might otherwise be incurred. There is too an old footscraper. The building itself was originally a private dwelling but in 1749 it became a Parish Workhouse and it is still marked as the same on the 1802 plan of Sherborne. Little information is available on life in the workhouse, but there is a record of the election in 1833 of William Nettleton as assistant Overseer of the Poor and Governor of the Workhouse and his wife Amelia as Governess. Perhaps they lived in that part of the building which is now ‘The Digby Tap’. The Workhouse was sold in 1839 and still appears on the Tithe Map of 1842. The two wings were demolished thoroughly (even the foundations were largely dug up) at some time between 1842 and 1869, when the stables for the Digby Hotel were built. Until the 1950s the courtyard adjacent to ‘The Digby Tap’ was occupied by small cottages and businesses. Visitors to my archaeological dig in 2002 remembered a blacksmith or farrier, a wheelwright and a knackers’ yard, but these declined and were swept away as Saunders’ Garage expanded. Fol 50 – 23rd February 1870 Caines and Croad work done converting a house to a ‘Tap’ on account of Digby Hotel £150.0s.0d. Fol 226 – 11th April 1870 Mr Quinton bell hanging to Hotel Tap £7.19s.3d. Fol 52 – 31st December 1870 W. Farrell for Hotel Tap £11.16s.7d. Mr Farrell was foreman of works on Digby Estate at the time. The ‘Digby Hotel’ was taken on by the School in 1964 but fortunately the ‘Tap’ has remained. Very little is known here. A.Binnie Clarke was the landlord of the Digby Hotel from 1878 and may have run the Tap also but the archive is unrevealing for the rest. A trench dug in 2002 produced a lot of older pieces of pottery. This trench produced 112 pieces of pottery; the other three trenches yielded a total of three pieces! I think this is because this trench was dug through an area where the previous inhabitants of ‘The Digby Tap’ had dumped their household rubbish, either in their own garden or yard, or over the fence onto a midden. Most of this pottery could be dated to between the 17th and 19th centuries and was predominantly plain earthenware vessels produced in the potteries at Donyatt in Somerset. Some pottery made at Verwood in the New Forest was also present, as well as bits and pieces from Staffordshire and some stoneware from Germany. I have to admit that the pottery is very much what one would expect from an archaeological excavation of an urban site of this period and all the pottery types are standard cooking and serving vessels from a lower or middle-class household. There are no exotic plates or examples of “the best china”, but that is probably because people took more care of these and they were passed down as heirlooms. Please see daily specials on our boards throughout The Digby Tap. Please note that all table bookings need to be made by telephone. Cricket – Our social cricket side were undefeated in 2017, both games were sadly beaten by the weather. So we still retain ‘The Ashes’ from our victory over The Rose and Crown in Trent at Compton House CC in 2016. Boules – We have a social boules team who are normally invited to play against Sherborne Boules Club on December 26th. We have in the past also played The Chetnole Chuckers. Pool – The Tap has 2 pool teams that play in the Sherborne League on Tuesday evenings. This follows on from the glorious Tap ‘B’ team winning the League title. Well done to them for retaining the pub bragging rights!